Nashville, TN – March 6, 2017 – CHRIS YOUNG scores his ninth U.S. No. 1 today as “Sober Saturday Night” his collaboration with VINCE GILL, takes the top of the Billboard and Country Aircheck radio charts this week. The “undeniably country ballad” (Taste of Country), named one of Esquire’s 10 Best Songs and written by Young with Brad and Brett Warren, is the third consecutive chart-topper from Chris’s RIAA-certified Gold album I’m Comin’ Over, which opened at #1 on Billboard’s Top Country Albums Chart. “Sober Saturday Night” is the follow up to Chris’s ACM, CMA and Grammy® nominated duet “Think Of You,” with Cassadee Pope. Chris formed his appreciation for the history of country music listening and watching closely to genre ambassadors like Gill. Growing up in Middle Tennessee, Chris witnessed Vince perform for a sold-out crowd at Nashville’s former Starwood Amphitheater. 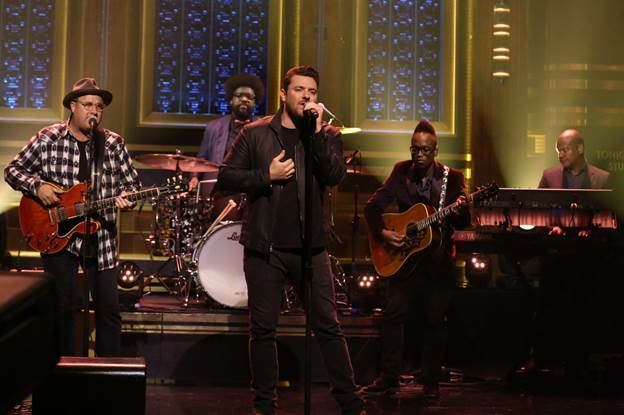 Chris and Vince debuted the celebrated single on “The Tonight Show Starring Jimmy Fallon,” performing the song with multi-dimensional hip-hop group The Roots in 2016. ABOUT CHRIS YOUNG: With five albums to his credit, Chris Young has amassed nine U.S No. 1 singles, and fifteen U.S. Gold/Platinum certifications. Among the RCA Records artist’s hits are “Gettin’ You Home,” “Voices,” “Tomorrow,” “I’m Comin’ Over” and “Think Of You,” the Grammy, ACM and CMA nominated duet with Cassadee Pope and fastest-rising single of Young’s career. Released in November of 2015 and debuting at No. 1 on Billboard’s Top Country Albums chart in the U.S., Young’s first co-produced album, I’m Comin’ Over, also includes his latest U.S No. 1 single, “Sober Saturday Night,” featuring Vince Gill, and the PLATINUM certified, three-week No. 1 smash title track “I’m Comin’ Over.” The single and album earned him four ACM Awards nominations, including his first in the coveted Album of the Year category as both the artist and producer, and a Billboard Music Awards nomination for Top Country Song. An international ambassador for country music, Chris has performed for audiences ranging from Good Morning America to Australia and beyond and will return to the UK in early 2017. Beginning in April he’ll join as special guest for Jason Aldean’s They Don’t Know Tour. For a full list of tour dates and more information, visit chrisyoungcountry.com.